Microsoft Scripting Guy, Ed Wilson, is here. This afternoon I am enjoying a nice pot of Oolong green tea. This tea has a great taste, especially when I add a bit of jasmine flowers. Oolong green tea steeps best if the water temperature is 185 degrees F—it really comes alive and is bursting with flavor. 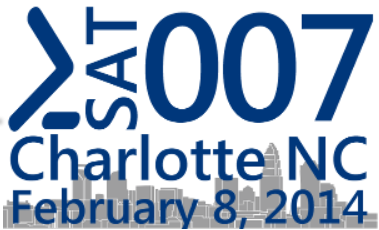 PowerShell Saturday #007 will be held in Charlotte, North Carolina on February 8, 2014. This will be an awesome chance to meet and to learn from some of the best PowerShellers around. In fact, five of the speakers are also speakers at the PowerShell Summit this year. There are a limited number of tickets still available for this event, so you’ll want to sign up now. The Scripting Wife wrote a great post that provides a quick overview of the event: Psst…Charlotte PowerShell Saturday Details Leaked. One of the most fundamental pieces of troubleshooting or security checks is to find out which of the many network adapters on a computer are actually connected to a network. One of the issues, from a management perspective, is that the command returns text. Therefore, if I need to parse the text to pull out specific information, such as the interface index number or the name of the adapter, I have to resort to writing a complicated regular expression pattern. If all I need to do is to obtain the information because I am writing to a log file as text, the command works great, and it is the lowest common denominator. I have used it all the way back to Windows 2000 days. It is possible to use WMI and the Win32_NetworkAdapter WMI class to retrieve information about the connection status. The NetConnectionStatus property reports a coded value that reports the status. These values are documented on MSDN: Win32_NetworkAdapter class. The difference is that instead of plain text, the command returns objects that can be further manipulated. 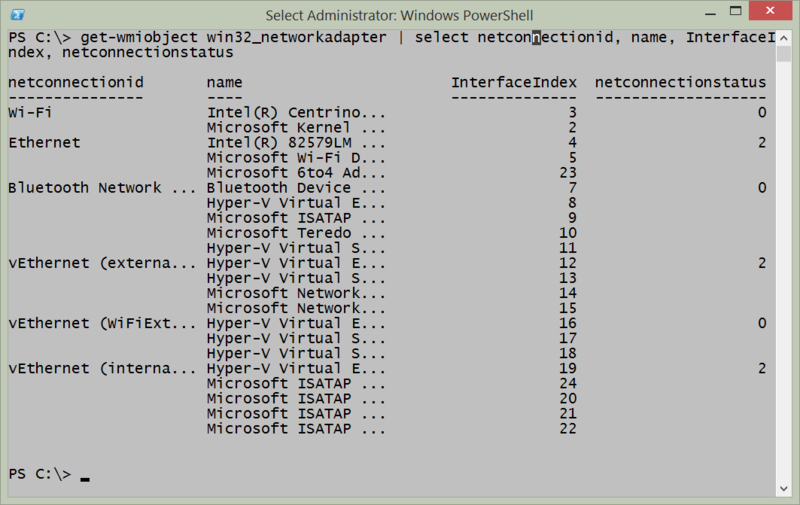 Therefore, while the previous command actually returns the network connection status of all network adapters, the Netsh command only returns the ones that are connected. 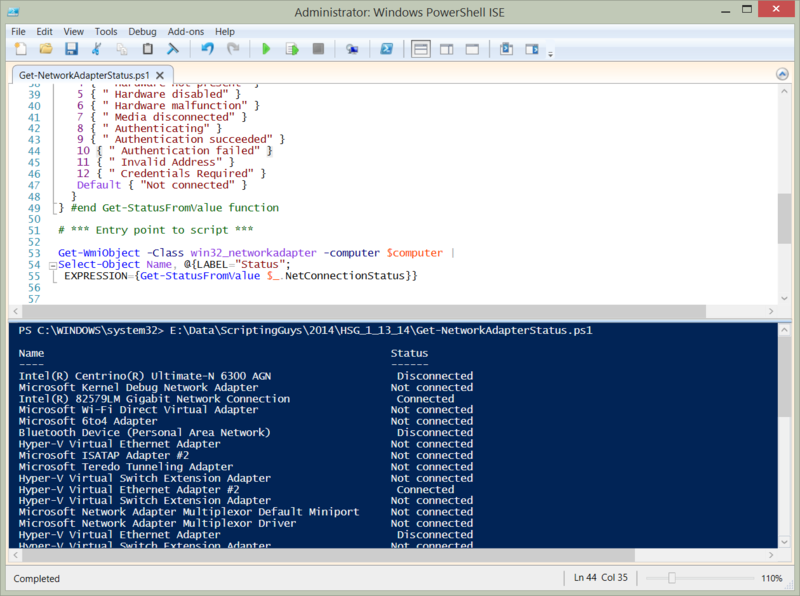 The Get-NetworkAdapterStatus.ps1 script requires at least Windows PowerShell 2.0, which means that it will run on Windows XP with SP3 and later. Produces a listing of network adapters and status on a local or remote machine. This script produces a listing of network adapters and status on a local or remote machine. Network Adapter Week will continue tomorrow when I will talk about working with network adapter power settings.